- Immediately after confronting Virgil in his little cave in the Glowing Sea and chatting about his condition you’ll receive this new quest, Hunter / Hunted. This takes place way back in the heart of the Commonwealth, so, happily, you can ditch the stupid Glowing Sea the moment you leave Rocky Cave and fast travel back. - The waypoint is located on the C.I.T. 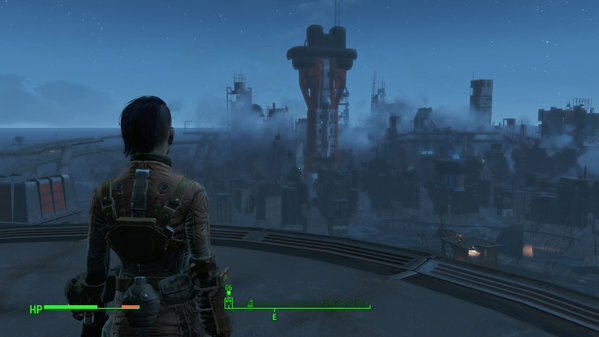 Ruins, just east of the road you probably travelled to reach Diamond City for the first time. (In case you’re wondering, you have to travel to the southern side of the Ruins to actually make them appear on your map.) There’s surprisingly little to see around the Ruins, aside from some salvage items and radioactive barrels on the front lawn. - You can, if you wish, enter the CIT Rotunda, the inside of the Ruins. Inside you’ll likely find a firefight between Super Mutants and Synths which the Super Mutants will almost certainly win. You can move through the Rotunda’s several floors and clear out as many enemies as you like, collecting items on the way, but your current destination is outside. - Open your Pip-Boy and change the radio to the Courser Signal. Doing so around the C.I.T. Ruins will trigger a percentile in the top-left corner of the screen, indicating the signal strength of the Courser you’re trying to track. It will take you to the east. - As you head east you’ll find a Raider base occupying roughly a block worth of terrain. The Courser isn’t inside this base, despite how the readings start to sound, and you can avoid it by slinking north or south. You can also probably take it down without much trouble, as the Raiders are fairly spread out between two buildings. Watch out for Turrets. There are some nice items inside, but nothing terribly notable. - Continue east and you’ll eventually find the Courser’s signal leading you to Greenetech Genetics, a large, green building with doors on the west side. 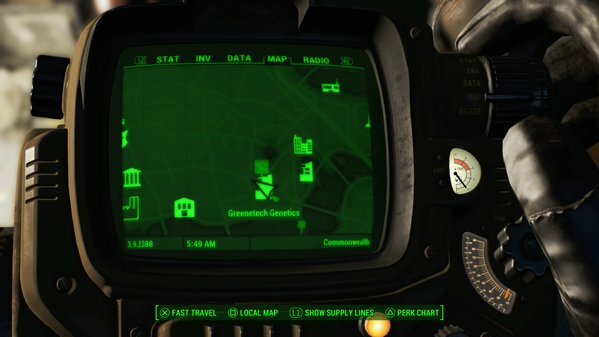 The location of Greenetech Genetics on your Pip-Boy. - The next hallway has a few offices with minor items inside ‘em. Follow the hall, remaining prepped for two Gunners who will appear once you turn a corner. There’s another office on your left and stairs to the third floor on your right. - Dead ahead on the next floor is a room with another Gunner inside. Make noise and a second Gunner will pop out of the room on the right. Take ‘em both down. The stairs on your left are blocked, so enter the long room on your right. There are two more Gunners waiting in here as well, and a third on the ramp up to the next floor. None of the items in this area are especially great, though there’s plenty for settlement-builders to scrounge. - A fierce firefight will break out as you approach the ramp to the fourth floor. There’s a bridge on your left and a small room with a terminal (and a window that pops open) straight ahead; if you hack the Novice terminal you can shut down the two Turrets up here, which, honestly, you may have destroyed from the second floor anyway. If the Gunners spot you across the bridge they’ll open fire and hurl molotovs. One of them has a Missile Launcher, so you really don’t want to get caught in a crossfire. Pull back and let them come to you rather than trying to charge across. - The room across the bridge contains a Chemistry Station, and, one room over, connects to another hallway. Directly across the hall is a Novice locked room; inside you’ll find some Fragmentation Mines on a desk, and other goodies besides. There’s another box of explosives here, on your right, but it’s rigged with a bomb of its own. Disable the trap before popping it open. - A ramp at the end of the hall leads to the next floor, and there are three Gunners in the room directly above who can easily spot you if you come up the ramp too quickly. Be prepared for a bit of a firefight unless you’re really quiet or really fast with V.A.T.S. The doors to the east and west of the ramp lead to a series of connected hallways that converge on a bridge, and beside the bridge a Novice locked terminal. This will deactivate two more upcoming Turrets. - Cross the bridge. If you’re not fast about it another Gunner may spot you from an adjacent room, and as you move through the next few offices three Gunners will slip through to confront you. Not good in a tight space, but it’s easy to get the drop on them if you pick a room and wait for them to enter. Check the office and hallways for items, then head out onto the next balcony to find more stairs. - The next set of stairs are just around the corner, but don’t run up too quickly, as there’s a Laser Tripwire in your way. Disable it to prevent a grenade from going off in your face. At the end of the next hall and down a ramp you’ll find a locked box with explosives inside, and on your left is a darkened room with another Gunner and another Laser Tripwire. If you go through an Advanced locked door on your right you can find a terminal that operates Turrets, spotlights, the Tripwire, and a nearby, goody-filled safe. Another Terminal back in the main room does all of the same, save for opening the safe. - The next room has multiple floors and is guarded by a number of Gunners. Deactivate the Turret in here and you’ll have a slightly easier time, but for the most part you’re just going to have to head in and take ‘em all down. Sneaking is tough, given the lights, but if you snipe the dudes on the stairs from the darker room you’re in you can potentially catch the guys on the upper floors unawares. Once the Turret’s down it’s not that tricky a fight either way. - Check the four offices on both floors of this room for minor items, then use the elevator by the stairs. This will take you up to a darkened room with a Master-locked cage in the middle. (No idea what’s inside. Anybody?) Go through the door in the rear and you’ll find an Advanced locked door on your immediate left; there are several items inside of use, including a Fusion Core. - Keep climbing stairs and you’ll hear people talking on the upper floor. The double door you need to enter is flanked by locked cages, and you can pop them open via Novice terminals. Nothing inside is terribly amazing. (Though the stuff in the left cages seemed better than the stuff in the right.) The stairwell beyond contains some useful items if you explore the abutting offices, though once you get to the top you’ll be facing someone rather nasty. Heeeeere’s your Courser. Z2 fights like a Synth mixed with Kellogg. He has the usual Synth laser weapon, but he combines it with Stealth Boys and Stimpaks to extend the fight. The result is a painful stealth brawl that will turn into a normal gunfight if you can last long enough. The easiest way to do this is to simply turn and run once Z2 disappears. He’ll follow you for a while, but he gives up partway down the stairs. Go back up and you can shoot him down normally, moving around the central cage on his floor for cover. Not too bad. Want a quick, hilarious alternative? Get past Z2 and you’ll find a steamer trunk on the stairs leading to the uppermost door on Z2’s room. There’s a Fat Man launcher up here, and if you have even one Mini Nuke and some decent aim you can probably wipe out Z2 in a single shot. Weeee! - You’re not done up here yet, though. The rest of the steamer trunk aside, there’s also a woman named K1 in a room near Z2. You can get her out of her room by grabbing the Greenetech Genetics Password from the toolbox near where Z2 was standing. Let her out and you can meet her again later in the game. (Where? When? Don’t know yet.) You can also use this Password to unlock the elevator near here to return to the main floor, and if that wasn’t enough, you can go through the topmost door to the roof, where you can quick travel to your heart’s content.